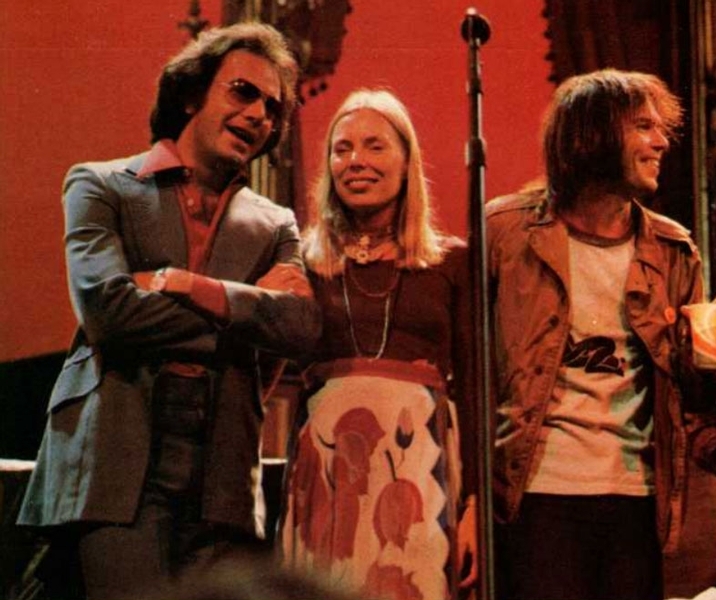 ‘Last Waltz’ guests Neil Diamond, Joni Mitchell, and Neil Young. One of the Kinks' best known songs is "Celluloid Heroes." In which Ray Davies tells us that "everybody's in show biz, everybody's a star." In 1978, it appears, almost every rock performer has got his of her name on a Hollywood marquee. From the ubiquitous Saturday Night Fever (Bee Gees) to a forthcoming, modestly-budgeted-movie on the late Buddy Holly, rock & roll is being sprocketed for a movie-going audience eager to see what they've been listening to all these years. Not that there's anything new about celluloid rock. Some sixties-era films - Monterey Pop and Woodstock - celebrated rock as festival, allowed us to peek at an audience as part of the concert. The Stones did the same thing in Gimme Shelter. Scattered in and around these rock germs were lesser stars, like Dave Clark's Havin' A Wilde Weekend, a boy-meets-girl saga which was patterned after innumerable films from the British pop idol Cliff Richards. The two decades after World War II saw a series of quickie exploitation films based either on a life style (the Annette Funicello-Frankie Avalon-beach-blanket-type) or a dance craze (the twist films of Chubby Checker). From time to time an experiment comes to light which stands by itself. Tommy, incandescent and enigmatic in its visual style, starred the Who as much as it did Ann-Margret. This year's crop - The Last Waltz, FM, TGIF, the forthcoming Grease - defy easy categories. I Wanna Hold your Hand has no musical soundtrack album, yet captures the lyric madness behind Beatle hysteria. While all of these celebrate rock & roll, early reports indicate possible audience disenchantment. One or more of these films may be yanked by distributors because of poor box office receipts. But still to come are more crowd pleasers, starring many of your favorites, among them a film about legendary French singer Edit Piaf, played by Bette Midler and a dramatization of their song "Desperado" starring the Eagles themselves. These coming attractions promise that this waltz isn't the last one. In fact, the dance has just begun. This article has been viewed 1,643 times since being added on February 6, 2017.